As many as three web interfaces were available at any given time. The traditional "Yahoo! Mail Classic" preserved the availability of their original 1997 interface until July 2013 in North America. A 2005 version included a new Ajax interface, drag-and-drop, improved search, keyboard shortcuts, address auto-completion, and tabs. However, other features were removed, such as column widths and one click delete-move-to-next. In October 2010, Yahoo! released a beta version of Yahoo! Mail, which included improvements to performance, search, and Facebook integration. In May 2011, this became the default interface. Their current Webmail interface was introduced in 2017. The launch of Yahoo! Mail Plus is part of Yahoo's strategic initiative to offer premium services that deliver innovative, reliable and relevant services to consumers ... In just five years, Yahoo! Mail has grown from one million to tens of millions of users, illustrating how consumers have made email an essential part of their daily lives. Through Yahoo! Mail Plus, Yahoo! continues to demonstrate leadership and innovation by offering consumers the industry's most complete and powerful email solution. On July 9, 2004, Yahoo! acquired Oddpost, a webmail service which simulated a desktop email client. Oddpost had features such as drag-and-drop support, right-click menus, RSS feeds, a preview pane, and increased speed using email caching to shorten response time. Many of the features were incorporated into an updated Yahoo! Mail service. On April 1, 2004, Google announced its Gmail service with 1 GB of storage, however Gmail's invitation-only accounts kept the other webmail services at the forefront. Most major webmail providers, including Yahoo! Mail, increased their mailbox storage in response. Yahoo! first announced 100 MB of storage for basic accounts and 2 GB of storage for premium users. However, soon Yahoo! Mail increased its free storage quota to 1 GB, before eventually allowing unlimited storage. Yahoo! Mail had free unlimited storage from March 27, 2007, until October 8, 2013. On September 17, 2010, Yahoo! showed off a new Mail program to reporters. Codenamed "Minty", the 2011 release was announced on September 16, 2010. It included a new interface, enhanced performance, improved Facebook and Twitter integration, the ability to watch YouTube videos straight from email, and improved search. Public beta began on October 26, 2010. In May 2011, the new Yahoo! Mail became the default interface. As the new interface became mandatory for users, some users of Yahoo! Mail reported slow typing speeds, contradicting Yahoo's claims of faster performance. Yahoo! offered no resolution to the problem as of September 12, 2011[update]. Users also missed the ability to paste textual email addresses into the sender box. The new version disabled the use of the "secondary" addresses provided in the previous version. The new interface overrode the browser's right mouse button (making functions such as opening mails in new tab windows unavailable). In 2013, Yahoo redesigned the site and removed several features, such as simultaneously opening multiple emails in tabs, sorting by sender name, and dragging mails to folders. The new email interface was geared to give an improved user-experience for mobile devices, but was criticized for having an inferior desktop interface. Many users objected to the unannounced nature of the changes through an online post asking Yahoo to bring back mail tabs with one hundred thousand voting and nearly ten thousand commenting. The redesign produced a problem that caused an unknown number of users to lose access to their accounts for several weeks. In December 2013, Yahoo Mail suffered a major outage where approximately one million users, one percent of the site's total users, could not access their emails for several days. Mayer publicly apologized to the site's users. Yahoo! Mail China officially announced its shutdown on April 18, 2013. Users were warned that all emails, contacts, and account settings would be inaccessible, unless users migrated to the American version of Yahoo! Mail. Individuals who made China Yahoo! Mail accounts during the Alibaba takeover were required to create new accounts under new usernames. In January 2014, an undisclosed number of usernames and passwords were released to hackers, following a security breach that Yahoo believed had occurred through a third-party website. Yahoo contacted affected users and requested that passwords be changed. 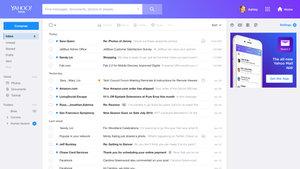 Yahoo updated the mail service with a "more subtle" redesign in 2015, as well as improving mobile features, and introducing the Yahoo Account Key, a smartphone-based replacement for password logins. On December 23, Yahoo introduced a new Developer update, containing not as many ads as previous versions. Yahoo! Mail is often used by spammers to provide a "remove me" email address. Often, these addresses are used to verify the recipient's address, thus opening the door for more spam. Yahoo! does not tolerate this practice and terminates accounts connected with spam-related activities without warning, causing spammers to lose access to any other Yahoo! services connected with their ID under the Terms of Service. Additionally, Yahoo! stresses that its servers are based in California and any spam-related activity which uses its servers could potentially violate that state's anti-spam laws. In February 2006, Yahoo! announced its decision (along with AOL) to give some organizations the option to "certify" mail by paying up to one cent for each outgoing message, allowing the mail in question to bypass inbound spam filters. In April 2011, Yahoo! Mail began rejecting spam reports, which involved sending a copy of the spam with full headers by email to Yahoo's abuse department, offering the use of a form instead. However, the requirement to use a form is prohibited by several Internet RFCs, and the availability of abuse at example.com (in this case abuse at yahoo.com) is required by the Invariants clause of RFC 2142, because the domain has a mail server and an MX record. Yahoo's claim was that its "standard" was better than the Internet standards referred to. This is the only working form through which users can report spam or misuse of the Yahoo! email service. When asked about these changes, Yahoo! explained that the changed words were common terms used in web scripting, and were blacklisted to prevent hackers from sending damaging commands via the program's HTML function. Starting before February 7, 2006, Yahoo! Mail ended the practice, and began to add an underscore as a prefix to certain suspicious words and word fragments. Incoming mail to Yahoo! addresses can be subjected to deferred delivery as part of Yahoo's incoming spam controls. This can delay delivery of mail sent to Yahoo! addresses without the sender or recipients being aware of it. The deferral is typically of short duration, but may extend up to several hours. Yahoo! does not specifically document this policy in detail, although some information is available. In 2004, Yahoo's Hong Kong office provided technical information to the Chinese authorities about the account of journalist Shi Tao, who was subsequently sentenced to ten years' imprisonment for "leaking state secrets". Yahoo! was criticized by Reporters Without Borders for acting as a "police informant" to increase its profits. In August 2007, the United States Congress began an investigation into Yahoo's handling of the case. Yahoo! founder Jerry Yang testified before Congress. On November 6, 2007, the congressional panel criticized Yahoo! for not giving full details to the House Foreign Affairs Committee the previous year, stating it had been "at best inexcusably negligent" and at worst "deceptive". Representative Tom Lantos described its executives as moral "pygmies". Yang stated that Yahoo! no longer controlled its Chinese operations, and was collaborating with human rights groups to formulate ethical code for technology companies. In a February 2006 hearing, Yahoo! executives swore that they had received no information about the investigation. Several months later, it was discovered that the document provided to Yahoo! China on April 22, 2004, by the Beijing State Security Bureau stated that "Your office is in possession of the following items relating to a case of suspected illegal provision of state secrets to foreign entities." On November 13, 2007, Yahoo! settled with Shi for an undisclosed sum. Shi was released from prison in September 2013. We continuously evaluate abuse patterns in registration usernames to help prevent spam, fraud and other inappropriate behavior. A small number of people registered for IDs using specific terms with the sole purpose of promoting hate, and then used those IDs to post content that was harmful or threatening to others, thus violating Yahoo! 's Terms of Service. 'Allah' was one word being used for these purposes, with instances tied to defamatory language. We took steps to help protect our users by prohibiting use of the term in Yahoo! usernames. We recently re-evaluated the term 'Allah' and users can now register for IDs with this word because it is no longer a significant target for abuse. We regularly evaluate this type of activity and will continue to make adjustments to our registration process to help foster a positive customer experience. In November 2012, an exploit for Yahoo! Mail was sold for $700 by an Egyptian hacker, allowing hijackers to hack Yahoo! Mail user accounts and redirect users to a malicious website. The attack used cross-site scripting which let hackers steal cookies. In January 2013, hacker and security researcher Shahin Ramezany pointed out another DOM-based XSS loophole that placed 400 million users at risk. From 2007, Yahoo! was the email service used by New Zealand Telecom, which came under criticism in early 2013 following a spam and phishing attack that was described as the biggest to have ever hit the country. Telecom and Yahoo! automatically reset "about 60,000" users' passwords. In April, Telecom announced that despite the issue, it would retain Yahoo! as an email provider. On October 3, 2017, Yahoo reported that all Yahoo user accounts, approximately 3 billion, were affected by the previously announced August 2013 theft of accounts. This information updates the December 14, 2016, announcement that more than 1 billion user accounts were hacked in a breach that had occurred back in 2013. Earlier that year in September, Yahoo! announced that an additional 500 million user accounts had been breached in 2014. The company was said to have discovered about the breach that affected hundreds of millions of accounts years before their initial announcement. The contents of Yahoo! Mail messages are scanned for the purposes of targeted advertising, in contrast to its main competitors Gmail (which ended the practice in late 2017) and Outlook.com (which did not employ the practice). The mobile app for Yahoo! Mail can be downloaded from the App Store for iOS, and the Google Play Store for Android. Both versions of the app perform the same function, but are tailored to the mobile device's operating system. Some characteristics include replying to a message by opening a notification and separately archiving, deleting and starring notifications. It is available in several languages. ^ "Locations". Yahoo!. Retrieved February 13, 2017. ^ "Yahoomail.com Traffic, Demographics and Competitors - Alexa". www.alexa.com. Retrieved February 4, 2019. ^ Parez, Sarah (February 13, 2017). "Yahoo Mail's mobile app now does Caller ID, syncs photos". Tech Crunch. ^ "Business Email Plans". Yahoo!. Retrieved April 5, 2014. ^ Pickavet, Henry (July 23, 2014). "Yahoo! Mail". TechCrunch. AOL. ^ Vascellaro, Jessica (October 31, 2012). "Gmail finally beats Hotmail, according to third-party data". Gigaom.com. Retrieved October 3, 2011. ^ Condliffe, Jamie. "Yahoo Mail Now Manages Your Entire Gmail Account Too". gizmodo.com. Retrieved April 14, 2018. ^ McDowell, David. "Yahoo! 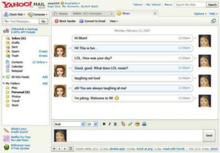 Mail Beta Was Released October 2010". Archived from the original on July 13, 2011. Retrieved July 2, 2011. ^ "Yahoo! Mail Beta Features". Retrieved July 5, 2011. ^ a b "Yahoo! Mail Beta Became Yahoo! Mail in May 2011". Archived from the original on June 28, 2011. Retrieved July 2, 2011. ^ "Yahoo! Completes Four11 Acquisition" (Press release). Yahoo!. October 23, 1997. Archived from the original on July 12, 2007. ^ "Yahoo! Expands Community Services with Free E-mail" (Press release). Yahoo!. October 8, 1997. Archived from the original on July 12, 2007. ^ Griffin, Gretchen. "Rocketmail Slowly Gets Grounded". Flak Magazine. ^ Hu, Jim (March 21, 2002). "Yahoo! tacks fees onto e-mail, storage". CNET News. Archived from the original on July 11, 2012. Retrieved June 1, 2006. ^ "Yahoo! unveils home page face-lift". ZDNet. July 2, 2002. Archived from the original on June 18, 2006. Retrieved May 31, 2006. ^ "Yahoo! Introduces Yahoo! Mail Plus To Help Consumers Manage Their Growing E-Mail Needs" (Press release). Yahoo!. November 14, 2002. Archived from the original on June 9, 2007. ^ "Yahoo! Begins Public Testing of New Yahoo! Mail" (Press release). Yahoo!. September 14, 2005. Archived from the original on June 9, 2007. ^ "Yahoo! Announces "New and Improved" Yahoo! Mail, Introduces Major Increase in Storage Space, Makes 50 Million Additional E-Mail Addresses Available" (Press release). Yahoo!. June 15, 2004. Archived from the original on July 1, 2007. ^ Mossberg, Walter S. (August 30, 2007). "Years in the Making, Powerful Yahoo! Yahoo Mail Is Worth the Wait". The Wall Street Journal. ^ "2010 new mail program". usatoday.com. September 16, 2010. ^ Srivastava, Kakul. "Yahoo! Mail Beta Was Announced On..." Archived from the original on May 26, 2011. Retrieved May 22, 2011. ^ David, McDowell. "Yahoo! Mail Beta Includes..." Archived from the original on May 18, 2011. Retrieved May 22, 2011. ^ McDowell, David. "Yahoo! Mail Beta Launched On October 26th 2010..." Archived from the original on May 18, 2011. Retrieved May 22, 2011. ^ Blue, Violet. "Anger explodes at Yahoo! Mail redesign disaster: Key functions removed or broken". ZDNet. Retrieved February 5, 2017. ^ Brett Molina (October 15, 2013). "Yahoo! email users not happy with redesign". Usatoday.com. Retrieved February 5, 2017. ^ Whitehouse, Kaja (November 11, 2013). "Yahoo! users gripe over latest email change | New York Post". Nypost.com. Retrieved January 31, 2014. ^ Blue, Violet (December 12, 2013). "Yahoo! forced to acknowledge Yahoo! Mail problems in worst failure yet". ZDNet. Retrieved January 31, 2014. ^ Anderson, Lessley (December 13, 2013). "Marissa Mayer apologizes for lengthy Yahoo! Mail outage". The Verge. Retrieved January 31, 2014. ^ Murphy, David (December 14, 2013). "Yahoo! CEO Marissa Mayer Apologizes for Yahoo! Mail Outage | News & Opinion". PCMag.com. Retrieved January 31, 2014. ^ "Yahoo! CEO Mayer Apologizes For Mail Outage That She Says Affected 1% Of Users". TechCrunch. December 13, 2013. Retrieved January 31, 2014. ^ "Yahoo! Mail Outage". Huffingtonpost.com. Retrieved January 31, 2014. ^ "中国雅虎邮箱于2013年4月18日启动整体迁移". Yahoo.com.cn. Retrieved April 18, 2013. ^ The China Yahoo! Mail Team. "China Yahoo! Mail is closing". Yahoo!. Retrieved April 18, 2013. ^ "China Yahoo! Mail is closing". Yahoo!. Retrieved April 18, 2013. ^ Mark Hachman (January 30, 2014). "Yahoo! acknowledges Yahoo! Mail hack". TechHive. IDG Consumer & SMB. Retrieved February 8, 2014. ^ "Yahoo! Mail gets a redesign, goes "password-free"". Siliconbeat.com. October 15, 2015. Retrieved February 5, 2017. ^ "Yahoo gives Mail a makeover and introduces Yahoo Mail Pro". engadget.com. Retrieved April 14, 2018. ^ "Yahoo! Terms". Info.yahoo.com. Retrieved February 5, 2017. ^ "AOL, Yahoo! and Goodmail: Taxing Your Email for Fun and Profit | Electronic Frontier Foundation". Eff.org. Retrieved January 30, 2012. ^ "Why am I getting "451 Message temporarily deferred" or "421 Message from x.x.x.x temporarily deferred" errors when sending mail to Yahoo!?". Yahoo!. 2007. Retrieved June 27, 2007. ^ "As a sender, how can I ensure uninterrupted SMTP access and prioritized delivery?". Yahoo!. 2007. Retrieved June 27, 2007. ^ "EastSouthWestNorth: The Case of Shi Tao". Retrieved January 21, 2007. ^ "Yahoo! 'helped jail China writer'". BBC News. September 7, 2005. Retrieved May 10, 2011. ^ "Yahoo! faces scrutiny in China case". MSNBC. Archived from the original on August 17, 2007. Retrieved August 8, 2007. ^ "中文新聞頻道". Rthk.org.hk. June 29, 2006. Retrieved January 30, 2012. ^ "BBC NEWS, US rebukes Yahoo! over China case". BBC News. November 6, 2007. Retrieved January 30, 2012. ^ Vindu Goel. "Yahoo! may be a moral pygmy, but Congress is hardly better". MercuryNews.com. Archived from the original on December 27, 2008. Retrieved January 21, 2007. ^ "Yahoo! chief apologizes to Chinese dissidents' relatives". MercuryNews.com. November 7, 2007. Retrieved January 21, 2007. ^ Tom Lantos (November 6, 2007). "Statement of Chairman Lantos at hearing, Yahoo! Inc.'s Provision of False Information to Congress". Retrieved January 31, 2009. ^ Oates, John (February 20, 2006). "Yahoo!Mail bans Allah and Dirty Harry handles". The Register. Retrieved June 27, 2007. ^ Oates, John (February 26, 2006). "Yahoo! unbans! Allah!". The Register. Retrieved June 27, 2007. ^ "Egyptian Hackers Selling Zero-day Exploit of Yahoo! Mail For $700". Retrieved November 29, 2012. ^ "Yahoo! Email-Stealing Exploit Fetches $700". Retrieved November 12, 2012. ^ "Yahoo! Mail hijacking exploit selling for $700". Retrieved November 26, 2012. ^ "Yahoo! Mail Hit By XSS Exploit Putting 400 Million Users At Risk". Retrieved January 13, 2013. ^ "Telecom rush to fix hack". 3 News NZ. February 11, 2013. ^ "Telecom defends email reset operation". 3 News NZ. February 18, 2013. Telecom is defending a move to cancel the passwords of about 60,000 Yahoo! Xtra customers which left some customers without access to their email accounts. ^ "Telecom sticks with Yahoo! email". 3 News NZ. April 5, 2013. ^ "Exhibit". www.sec.gov. Retrieved October 8, 2017. ^ "Yahoo! says 1 Billion User Accounts were hacked". The New York Times. December 14, 2016. Retrieved December 15, 2016. ^ Fiegerman, Seth (September 23, 2016). "Yahoo! says 500 million accounts stolen". CNN. Retrieved December 15, 2016. ^ "Yahoo! data breach casts 'cloud' over Verizon deal". The Washington Post. September 22, 2016. Retrieved December 15, 2016. ^ MacMillan, Douglas; Krouse, Sarah; Hagey, Keach (August 28, 2018). "Yahoo, Bucking Industry, Scans Emails for Data to Sell Advertisers". Wall Street Journal. ISSN 0099-9660. Retrieved August 28, 2018. ^ "Yahoo and AOL just gave themselves the right to read your emails (again)". CNET. April 13, 2018. Retrieved August 28, 2018. ^ Schofield, Jack (April 19, 2018). "What's the best email service that doesn't scan emails for ad-targeting?". the Guardian. Retrieved August 28, 2018. ^ "From Tamil to Bengali, Yahoo! Mail android app gets seven new Indian languages – The Economic Times". M.economictimes.com. October 26, 2016. Retrieved February 5, 2017. Wikimedia Commons has media related to Yahoo!.